Our B&B in Albert, France used to be a brewery. 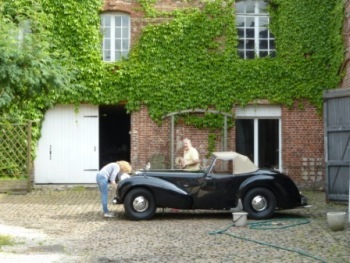 The current owners have refurbished it and have plenty room for their vintage cars, including this rare 1939 Triumph. 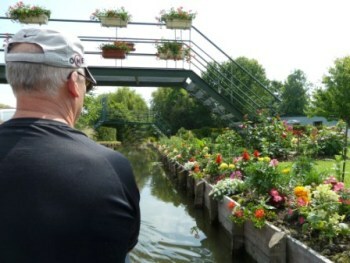 In Amiens we floated for 45 minutes through the Hortillonages "floating gardens". These 741 acres of what used to be swamp land have been reclaimed by local farmers to grow produce and flowers. 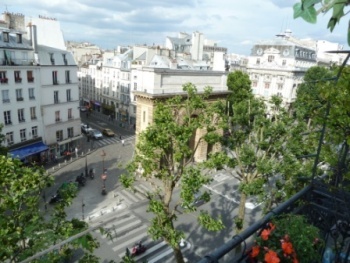 Our apartment in Paris is in a great location right on the Boulevard Saint Denis. The flower-filled balcony overlooks the Saint Denis gate to the city and has a metro stop right in front of the building. What? 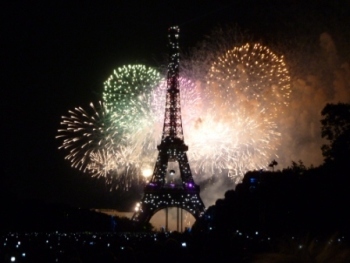 Something FREE in Paris? 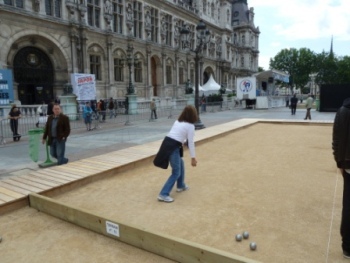 Yes, right here in front of the Hotel de Ville (City Hall) they were promoting the World Champion petanque finals that will be in Marseille this fall. Eight petanque couts were available, equipment was provided and they even offered a free cup of Ben & Jerry's ice cream to everyone! Can you imagine a more romantic view while having a picnic lunch? 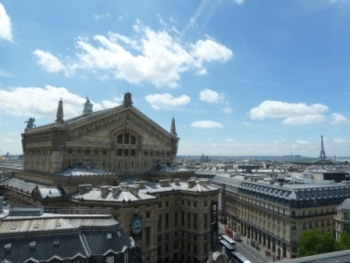 We sat on the roof terrace of the Galeries Lafayette and looked at the Opera House and the Eiffel Tower. 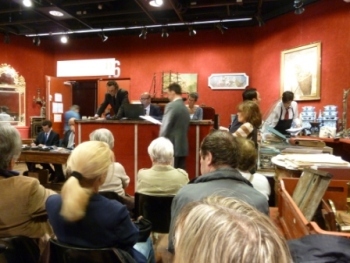 At Drouot (the French answer to Southby's Auction House) we sat in on some bidding. The large picture on the wall sold for $125,000 USD!! You know you are in a great city when you can't tell from a picture if you are in an Opera House or a Mall! 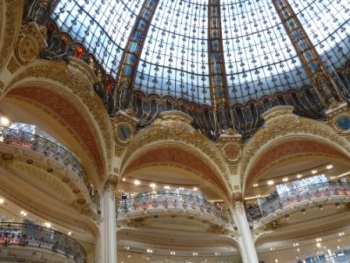 The picture to the left is the ceiling of the Opera Garnier and the one to the right is the central dome of the Galeries Lafayette. We actually were able to get tickets - not to the Opera, but to a Fashion Show at the Department Store. 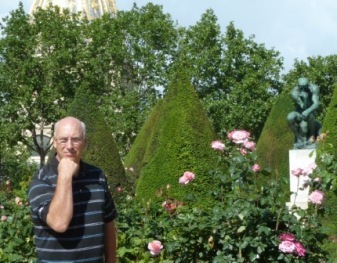 Paris is home to the rich & famous -not just the living ones, either. 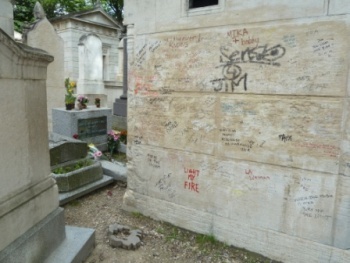 At the Pere La Chaise Cemetery we visited this small defaced grave (from fans writing tributes) of Jim Morrison along with other greats like Chopin, Oscar Wilde & Gertrude Stein. 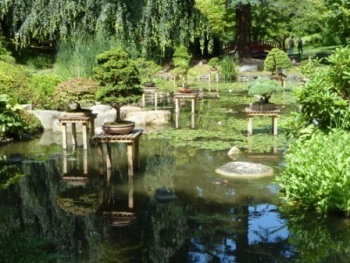 The Albert Kahn gardens are a hidden gem in the outskirts of Paris; that our friend, Barb Kelley, shared with us. 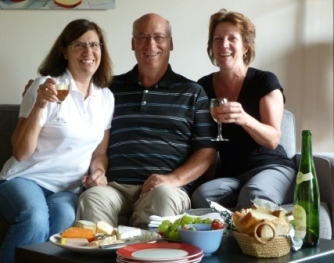 We were so happy to spend a few days with our friend, Liz, who joined us as we "foraged" at the Bastille Market and then shared our spoils during our nightly ritual wine, cheese and meats dinner. We saw these items at the Marché aux puces de la Porte de Vanves, a flea market. They cost $144USD for a set of 12. 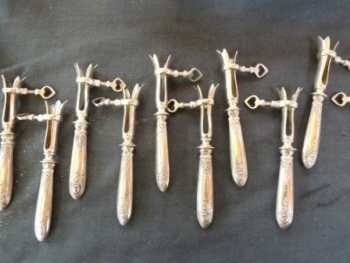 We had to ask what they were. . .19th Century lamb chop holders. You insert the bone and tighten it down so you don't have to touch it while you eat. Ah, so civilized. 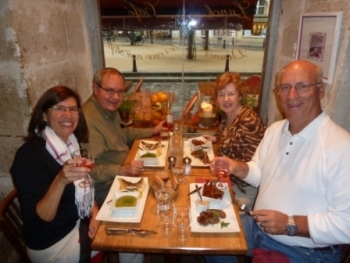 We had a fun night out with friends, Bob and Barb Kelley, at La Rose de Paris on the Ile de la Cité. People are always commenting on the small portions served at french restaurants. 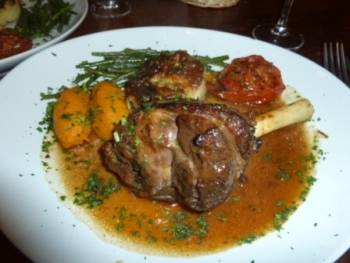 This delicious lamb shank we were given at Chez Toinette definitely proves them wrong. 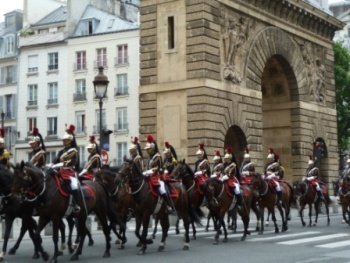 On Bastille Day (July 14), Paul looked out of our balcony and saw the Cavalry parading by. We had a private "pre-show". 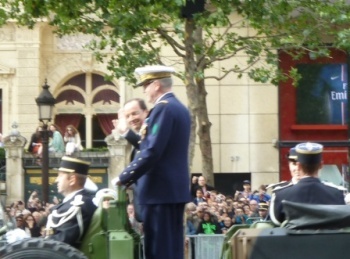 On the Champs-Elysées, the new President of France, François Hollande smiled and waved at me (or maybe the guy right behind me) right before the Opening Fly over for the Military parade. 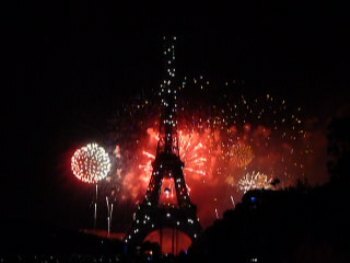 Of course, what would an Independence Day celebration be without a huge fireworks display that night at 11PM behind the Eiffel Tower, accompanied by disco music? Chez Toinette, 20 rue Germain Pilon, 75018 (at the foot of Montmartre) tel. 01-42-54-44-38 open everyday except Sunday - We loved this restaurant both times we ate there. Great food, great service, great atmosphere and great value. The owner and his wife treat everyone like family. They both speak English. 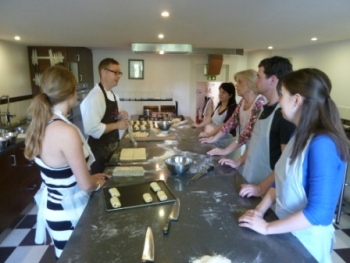 Our favorites were the seared scallop appetizer & duck breast or lamb shank main courses. The least expensive bottle of red wine is wonderful. You need to call ahead for reservations. La Paella, 50 rue des Vinaigriers, 75010 (near Canal St. Martin) tel. 01-46-07-28-89 - Like a visit to Spain - friendly service, excellent northern Spanish food, good value. Lunch menu is 14€ and includes first & second course, dessert, wine & coffee. Enfant Rouges market - Several ethnic restaurants inside the market - Moroccan, Chinese, Lebanese - all with outdoor seating, good prices and fun atmosphere. Tip: get there as close to noon as possible to get a table. 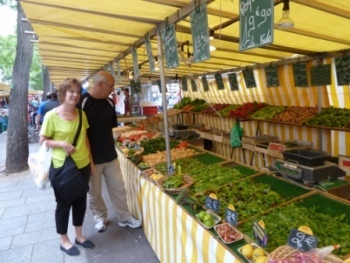 Picard frozen food (chain store)- This is hard to believe, but the croissants, pain au chocolat and flammkuche are some of the best we've ever tasted and at a fraction of the cost of a restaurant or boulangerie. 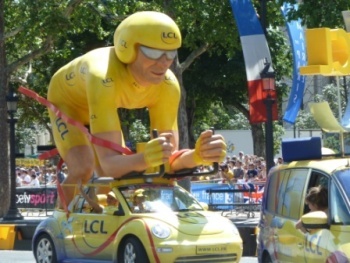 Standing on the Champs-Elysées waiting for the Tour de France was a treat. 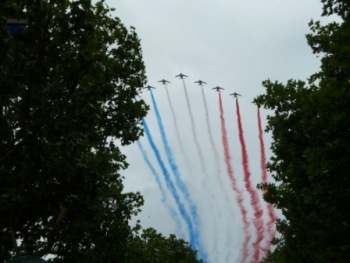 Before the riders arrived in Paris, there was a 45 minute parade (Caravan) of tour sponsors. 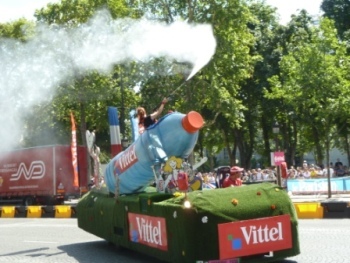 Vittel, bottled water, sprayed the air to the delight of the warm crowd. Team Sky was the big winner. 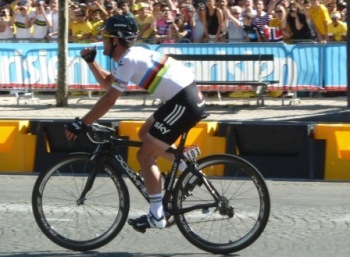 Mark Cavendish won the final stage. 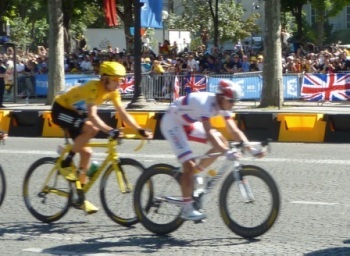 And Bradley Wiggins (yellow jersey) won the Tour.